NC DNA Day » One potato, Two potatoes, Three potatoes, Four! As the days get longer, the air gets warmer, and the sun shines brighter, we may begin to notice fresh fruits and vegetables growing around us and appearing in local grocery stores and markets. Food crops, including grains, fruits, and vegetables, are harvested to feed the growing world population of over 7 billion people. A few of the leading food crops around the world are maize, plantains, soybeans, wheat, and sweet potatoes. Since 1971, North Carolina has been the number one sweet potato producing state in the United States. 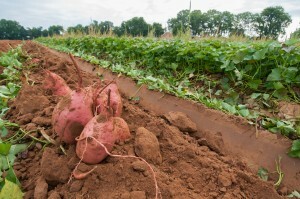 Historically, sweet potatoes produce a decent harvest even in imperfect soil. In fact, sweet potatoes are so willing to grow that potatoes accidentally dropped on the ground can grow into sweet potato plants if the soil they land on is warm and moist enough. Still, there are many steps that farmers can take when planting, growing, and harvesting sweet potatoes to improve the quality and quantity of the crop. The first step in farming sweet potatoes is to plant them. Root development of the sweet potato depends on having plenty of air space in the soil. In other words, the soil needs to have good aeration. Loose, sandy, well-drained soil is ideal for sweet potatoes, since this kind of soil allows the root to have good access to oxygen. It is also important to remove weeds so that the growing sweet potatoes do not have to compete with the weeds for nutrients. Interestingly, sweet potatoes are grown from sprouts that come from stored sweet potatoes. You may have noticed these sprouts if you have ever had potatoes sit in your kitchen for a while. Once the sweet potatoes have been planted, adding fertilizer to the young plants can help them to grow. Fertilizer often includes nutrients such as nitrogen, phosphate, and potassium. While sweet potatoes do not require as much of these nutrients as other plants do, they are important for the growth of the plant. In addition to plants using nutrients from fertilizer directly, bacteria in the soil help the plant to use the nutrients efficiently in a process called symbiosis. In March 2017, scientists at the University of North Carolina at Chapel Hill published their findings about how bacteria that live in the soil around a plant’s roots help the plant to use phosphate to improve yield of the crop. Another important part of helping sweet potatoes grow is making sure they do not get a sweet potato disease. Sweet potatoes can be infected by viruses, have parasitic worms, or rot for a variety of reasons. Fortunately, there are several ways that farmers manage each of these diseases such as crop rotation, harvesting at the proper time, and keeping sweet potatoes well-ventilated during storage. After sweet potatoes grow for three to four months, they are ready to be harvested. Some farmers harvest sweet potatoes by hand, rather than by using a mechanical harvester, to avoid damaging the potatoes in the process. Either way, it is necessary to loosen the soil around the plant so that the tubers are not injured. Sweet potatoes are not very sweet when first dug, even though they are called sweet potatoes. They need to sit in a warm, well-ventilated place for about 10 days so that scratches in their skin will heal and the flesh inside will become sweeter. The combination of warmth and time activates an enzyme that converts the complex carbohydrate, starch, into maltose, a simple sweet sugar. Although sweet potatoes are able to grow without much care, it is clear that the efforts put forth by farmers increase the yield of this valuable crop. Thanks to their work in planting, growing, and harvesting sweet potatoes, we all are able to enjoy a delicious and nutritious treat!